Here's the painting I did on Friday. I arrived on site fairly early so I took a little time to map out some of the major tonal masses before painting. Actually, I sat and looked around for quite a while before I even set the easel up. The sun was so high I couldn't see much for the glare! 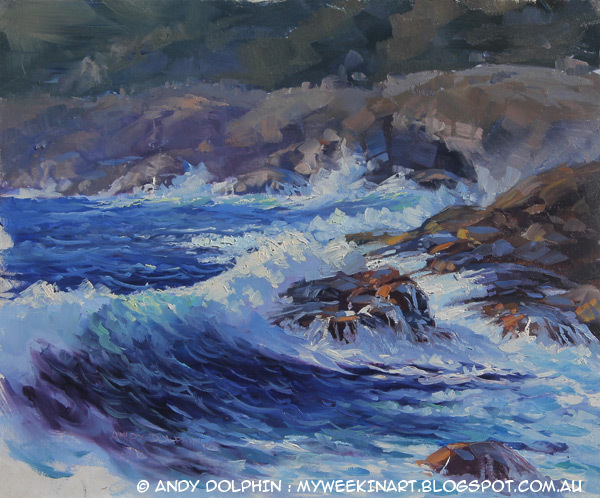 In this painting I used cerulean blue to make the transparent green in the wave. It's less invasive than the spectrum viridian (based on pthalo green) that I occasionally use, and will do the job well enough in most cases but it doesn't make the rich, translucent green that the viridian can. This one is shown exactly as it was when I packed up. No touch-up back in the studio.